Montini coach Israel Martinez has had a lifetime worth of highlights in eight-plus seasons. Six state titles, a perfect dual-meet record in 2011-12, multiple individual state champions and even more medalists. But Martinez has never had a wrestler finish a season unbeaten — not because the Broncos haven’t had some stars, but because their national schedule is so tough. That may change this season, however. Senior Jake Stiles, an Oklahoma recruit, is 43-0 at 152 pounds after another dominating performance at Saturday’s Class 3A Bolingbrook Sectional. Stiles, ranked fourth nationally by Intermat, had a pin and two technical falls to stay on his season-long roll. It’s not something he concerns himself with, though. Stiles’ path to his current status might explain why he’s on the verge of making Montini wrestling history. “You hate to admit it, but failure’s made him tougher,” Martinez said, noting that Stiles didn’t make the varsity team as a freshman and didn’t qualify for state as a sophomore. “We were right there with the state guys, right there with the best guys (two years ago). But we weren’t there yet,” Martinez added. Stiles clearly is among the elite now, though he’s anything but satisfied. Stiles and the Broncos did pretty well on Saturday, though. They advanced 10 wrestlers, including five champions, to the state finals, which start Thursday at State Farm Center in Champaign. Mount Carmel had eight qualifiers, including one champ, while Marmion advanced seven, including five champions. Marist (five), Naperville Central (four) and St. Rita (three) were the other teams with more than two qualifiers. Not everyone had as easy a road to a title as Stiles. Marmion teammates Michael Jaffe (120) and Brad Gross (160) both needed overtime to prevail in the championship round. Jaffe also had an OT win in the semis. 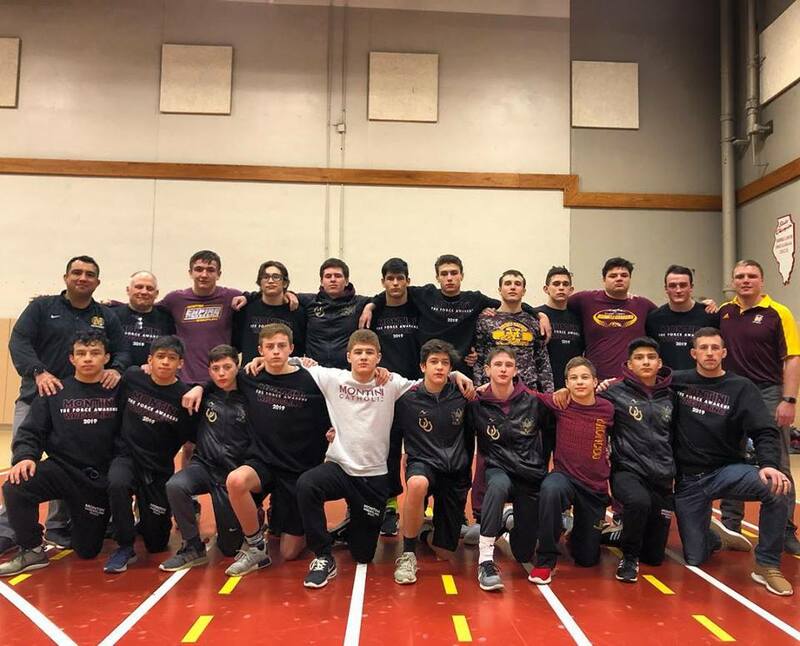 “They were absolute grinders,” Jaffe said after beating Mount Carmel’s Rahan Uribe 11-9 in the semis and edging Montini’s Nain Vasquez 9-8 on an ultimate tiebreaker in the final. Jaffe (38-3) was expecting nothing less. Gross (29-5) beat St. Rita’s Marty Larkin 10-6 in the final after falling behind 4-0. Another Marmion wrestler involved in a close final was Trevor Chumbley (37-2), who beat Montini’s Fidel Mayora 1-0 at 145. It was the pair’s third meeting this season — all won by Chumbley by a total of five points — and eighth in two seasons. “It’s pretty crazy,” Chumbley said of the “Groundhog Day” regularity with which he faces Mayora. In fact, they could meet two more times, at individual and team state. Montini’s other winners were Dylan Ragusin (39-6) at 126, Dylan Burnoski (37-6) at 132, Trevor Swier (35-7) at 182 and Peter Christensen (43-2) at 195. Marmion also had titles from Diego Sotelo (41-3) at 106 and Ryan Fleck (33-6) at 138. Also winning titles were Mount Carmel’s Colton Drousias (31-4) at 113, Naperville Central’s Jackson Punzel (39-3) at 170, Waubonsie Valley’s Garrett St. Clair (32-4) at 220 and Kennedy’s Jason Joy (28-3) at 285.